As the debate over FDI (even for single brand retail) continues, over 250 international brands in the food service and fashion and lifestyle sectors alone continue to service the Indian consumers. 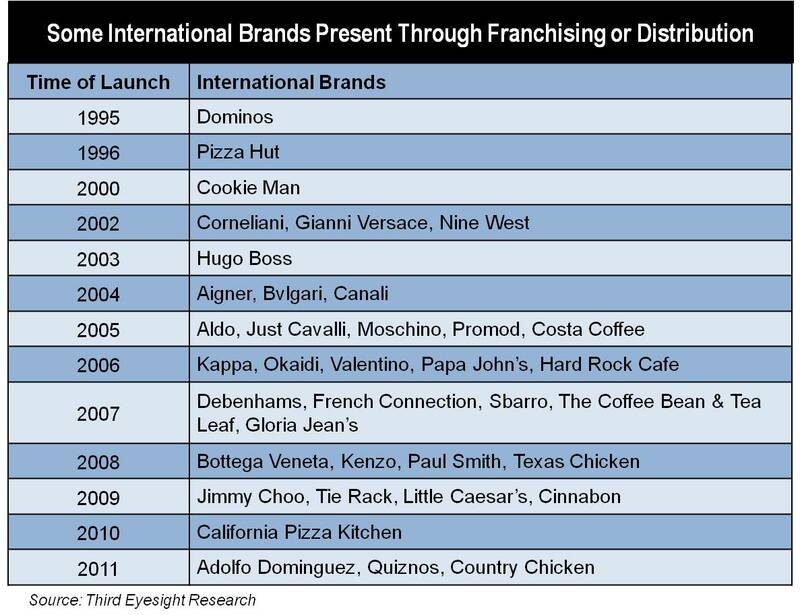 Interestingly more than half of them are present in the Indian market through the franchising route. Franchising has been a preferred entry strategy especially in case of the food service sector. Many of the international food brands have opted to give the master franchise to an Indian partner who can use the international brand’s name but is responsible for sourcing the ingredients and maintaining the international quality standards for food and service. One such example is Dominos, which incidentally is also the country’s largest international food service brand. Of course, as FDI liberalisation seems nearer the finish line, brands such as Starbucks are choosing to join hands with an Indian partner while others such as Denny’s Corp are planning to tie up with regional licensees. In case of the fashion sector, in the early years of liberalisation few international companies chose franchising. Instead some chose licensing to gain a quick access to the Indian market at a minimal investment. Others set up wholly owned subsidiaries or entered into majority-owned joint ventures to have a greater control over their Indian business operations, product sourcing and supply chain and brand marketing. However, at the turn of the last decade, many international fashion brands chose franchising owing to favourable business environment. An environment conducive for growth of franchising was created by reduction in import duties under WTO agreements, the absence of a wide network of multi-brand retail platforms, the need for using exclusive branded outlets as a marketing tool to create a full brand experience and the simultaneous growth of real estate investors who were potential master franchises ready to invest capital and real estate. The question is how the liberalisation of FDI norms will impact the choice of market entry strategy for the international brands. Would franchising continue to remain the preferred entry mode as we set into the liberalised FDI regime? The change in foreign investment norms has already led to some brands (in particular those in the fashion and lifestyle sector) transitioning their existing licensing or franchise partnership into a joint venture or wholly owned subsidiary while the new entrants are actively considering ownership routes rather than franchising. Certainly, the ideal scenario for an international brand would be to have complete ownership and control over the operations in a strategic market like India, but direct investment does also increase their risk and the investment is not financial alone. Amongst other choices licensing offers the least control, and while joint venture may be preferable for some brands, for many franchising still proves to be the practical choice for some time to come. Franchising may potentially be quicker way to launch with higher chances of the retail business being successful. As it is an “entrepreneurship” model of business, the franchisee’s motivation to make the venture a success is high. The international brand has an assured income by way of royalty on the license agreement and could expand more rapidly in the market. Having a local partner with a closer understanding of the market and the ability to adapt to the changing needs of the consumers also helps to ensure that the international brand’s offering is tuned in to consumers’ demand. Further, unlike more developed markets where brands have sizable networks of large-format store as a launch and growth platform, in India there are still limited choices to simply “plug-and-play” using department stores or any other large-format retail network. Partnering with a franchisee who has access to retail real estate can be a quick way to reach the target consumers. On his part the franchisor needs to ensure that the business model is well thought through in terms of the team and infrastructure required and is scalable. For a successful relationship it is vital that the franchisee has an entrepreneurial mind-set. The essence of the brand needs be well understood, and the franchisee must have operational involvement rather than a “passive investment” approach. If both partners understand their respective responsibilities, franchising can truly be a win-win business model. This is true that franchises should be liberal and better free for experimenting.This is a way for the people to expand their franchises. Thanks for sharing and keep on updating the good work.